The Mining and Mineral processing industries have some highly specific requirements for their enclosures, and many of B&R’s products are designed to meet these applications. Standard enclosures need to be extremely robust not only to suit the application, but also the extreme environments in which they are usually installed. 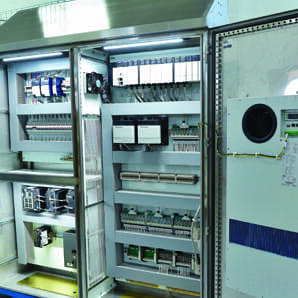 The Oyu Tolgoi mine required custom switchboards, PLC panels, local control stations and enclosures for use on the mine site. This entry was posted in Copper, Mining Enclosures, Mining, Oil & Gas, Projects and tagged Custom Enclosures on March 12, 2018 by Jaylene Young. This entry was posted in Industrial, Junction & Marshalling, Mining Enclosures, Power Distribution Industrial, Process Automation & Control, Product, Special Purpose, Stainless Steel Enclosures, Steel Enclosures and tagged Australian Made, Color 316SS, Color X15, IP66 on April 2, 2015 by Caroline Jones. The Incline SR is an IP66 enclosure for the mining and mineral processing industries featuring a 30 degree sloping roof to reduce build up of debris and waste material. This entry was posted in Industrial, Junction & Marshalling, Mining Enclosures, Power Distribution Industrial, Process Automation & Control, Product, Special Purpose, Stainless Steel Enclosures and tagged Australian Made, Color 316SS, Color X15, IP66, Lloyds on March 9, 2015 by Simon. The Pilbara SP is an IP66 enclosure for the mining and mineral processing industries designed to withstand the harsh environments of the Pilbara. This entry was posted in Industrial, Junction & Marshalling, Mining Enclosures, Monarch IP, Power Distribution Industrial, Process Automation & Control, Product, Special Purpose, Stainless Steel Enclosures, Steel Enclosures and tagged Australian Made, Color 316SS, Color X15, IP66, Lloyds on March 4, 2015 by Simon. An IP66, special purpose, sloping roof enclosure with a 40° sloping roof and overhang for reduced material build up. This entry was posted in Industrial, Junction & Marshalling, Mining Enclosures, Power Distribution Industrial, Process Automation & Control, Product, Special Purpose, Stainless Steel Enclosures and tagged Australian Made, Color 316SS, IP66, Lloyds on January 23, 2015 by Simon. The Lambert LB is a 316 stainless steel, sun shaded enclosure designed for applications where the enclosure has a high risk of heating up due to excessive solar radiation. This entry was posted in Industrial, Junction & Marshalling, Mining Enclosures, Monarch IP, Power Distribution Industrial, Process Automation & Control, Product, Special Purpose, Stainless Steel Enclosures and tagged Australian Made, Color 316SS, IP66, Lloyds on January 20, 2015 by Simon. A 15 degree sloping roof enclosures for electrical and electronic control equipment in rugged, dusty industrial applications. This entry was posted in Industrial, Junction & Marshalling, Mining Enclosures, Monarch IP, Power Distribution Industrial, Process Automation & Control, Product, Special Purpose, Stainless Steel Enclosures and tagged Australian Made, Color 316SS, IP66, Lloyds on January 19, 2015 by Simon. The Miner ME is designed to be used in underground for 1000 Volt applications. It’s made from 2mm thick steel with polyester paint to provide superior protection and visibility. This entry was posted in Industrial, Junction & Marshalling, Mining Enclosures, Power Distribution Industrial, Process Automation & Control, Product, Special Purpose, Steel Enclosures and tagged Australian Made, Color French Blue, IP66, Lloyds on January 17, 2015 by Simon.